Revealing mistake: In the warehouse when Billy kicks one of the black-suited bikers off his bike into the stack of empty tin cans, black wires pulling the bad guy up off the bike and into the cans are visible. Continuity mistake: When Billy Lo is fighting the huge guy, he gets a footprint stamped onto his jumpsuit, the print changes size throughout the fight. Deliberate mistake: Rather than using real Bruce Lee footage only for the final fight scenes, so the undisguised Billy Lo's different appearance might make sense after his surgery, the filmmakers instead spliced real Bruce Lee face footage throughout the early film giving the character a constantly changing face from scene to scene. Other mistake: When the bad guys are taking the cash from the vault, they finish with just 3 duffel bags. Yet there are blocks of cash along all the walls, roughly 25 times as big as what they're taking. With the duffel bags supposedly containing $100 million, there would be tens of billions of dollars for the taking. Their escape route is up the elevator to the roof, and into a helicopter. What bad guys wouldn't take all they could carry? Continuity mistake: When Wesley arrives at Redvale, he goes down into the vault area. When he turns the corner (just a few feet down from the lobby), he sees the bodies of the slain guards on the floor. The vault area is not cordoned off, not closed to the public, and wide open to view by anyone stepping just a few steps down the stairs. Yet there is nobody anywhere to be seen - despite this being the middle of a workday, and the lobby being busy with people just a few minutes before. Other mistake: Like many movies, the security guard at the front desk of Redvale appears to have intimate knowledge of the CEO's personal calendar, and can verify their appointments - such as the bad guys when they show up. Not impossible, but very very unlikely. Factual error: When the bad guys collect the $100 million in cash from the vault, it's been laid out in just 2 suitcases. According to US government specifications, that much cash (it is mentioned in the movie that it is in $100 bills) would be a single pile nearly 50 feet high (about 10 times what is shown) and 1,000kg - a full ton of weight. Continuity mistake: When Marcus steals the ambulance and drives to the Redvale HQ, he drives past the same corner three times. Billy Lo: You lose Carl Miller. 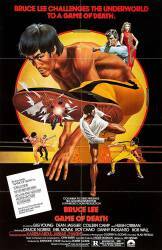 Two of Bruce Lee's earlier films, The Way of the Dragon and Fist of Fury, are seen as films Billy Lo (Bruce Lee) is starring in, Fist of Fury being the one where Billy is shot.